Hi friends! Happy Monday. This week the Karber Challenge is to use a digital stamp and ribbon. Hope you can join us. Visit the Challenge blog to see the lovely cards and projects of Linda, Kerry and Lisa. 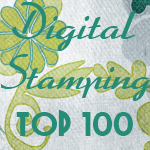 Our designers used digital stamps from the Love and Friendship collection you can find them here. Cute card. First time I have ever seen these images. They are darling! !